When Dr. Mayeda asked me to write a foreword for Fighting for Acceptance I said, 'Yes, of course I'll write a forward!' But then I asked myself, 'What the hell is a foreword?' After a quick internet search I realized that I was presented with the daunting task of placing words on a page that would be read by millions of eyeballs, and I had a mini-panic attack. It's rare for me to feel that emotion. I was sweatin', but then that I switched on MayheM-mode and realized that I strip down to my skivvees and punch, kick, and choke other grown men for the enjoyment of thousands of bloodthirsty fans, who shout out their enjoyment at every violent act that I commit with a chorus of blood-curling shrieks, like the speaking of tongues at a Pentecostal church. The image of two warriors battling in an enclosed cage sparks images of Roman times, as gladiator slaves fought each other to the death for the enjoyment of the crowd, who eventually tired of the spectacle, and upped the stakes by placing the wretches of society to do battle with lions and tigers. To the untrained eye (read: ignorant) we aren't too far from that point. All that we would need is George W. Bush wearing a laurel giving the thumbs up or down on the life or death of a competitor. But again that is simple minded ignorance, to be redundant. The simplicity of our sport is also its beauty. The rules are so basic and unrestrictive that they lend themselves to some of the most beautiful exchanges and most heart wrenching stories that could take place over the course of a few five minute rounds. Once you learn what is going on between the ropes, or within the confines of the rubber coated fencing, barbarism quickly shifts to science. Savagery to strategy. Brutality to the pureness of sport. I didn't get into this sport for the chance to beat someone up without going jail. I entered into this sport for the skill, for the challenge and brains it takes to succeed in the arena of combat. The allure of playing the now cliched 'Ultimate Game of Chess' was much too strong for me to pass up. 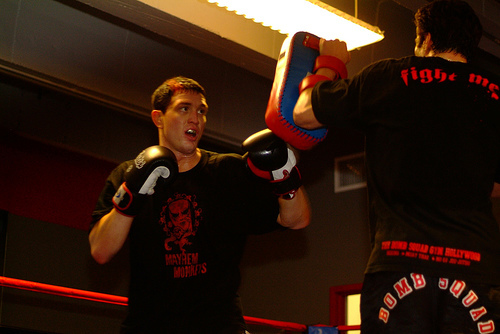 If boxing is the 'sweet science,' then mixed martial arts must be considered quantum physics. This book also includes some powerful suggestions to help push the sport forward. I'm a pessimist, so I don't have the greatest feelings about the suggestions coming to fruition, but I'm glad that Dave has the gusto to press forward. In fact, I can't think of someone better qualified to write such a book. Rarely do you run into a scholar with such a passion for mixed martial arts. Also being an athlete himself lends a special perspective that a normal bookworm couldn't begin to ascertain. For the next few hundred or so pages, David Mayeda should take you through the sport's long journey, through its inception as a violent spectacle to its current stage, now considered the fastest growing sport in America. During that journey, you will get to hear from some of the sport's biggest stars, many of whom have walked down the long and twisted road that is mixed martial arts, often stumbling, and at times crawling, but now standing tall and proud as a staple in mainstream American culture. Click here to go back to FIGHTING FOR ACCEPTANCE main page.